If I could be any Food Network Star, I would definitely be Giada De Laurentiis…I love her, she makes food that looks and taste great and she’s not annoying to watch on TV. When I want to experiment and cook something new, I always look for one of her recipes to make. I don’t know how it is with the rest of the Food Network Stars, but most of her recipes always get 5 star reviews from people and I think that is a testiment to itself why she’s so awesome. Anyway, enough about going on and on about why I love Giada haha. Well, this week I decided to make two of her recipes: Salmon with Lemon, Capers, & Rosemary and Tri-Colore Orzo. 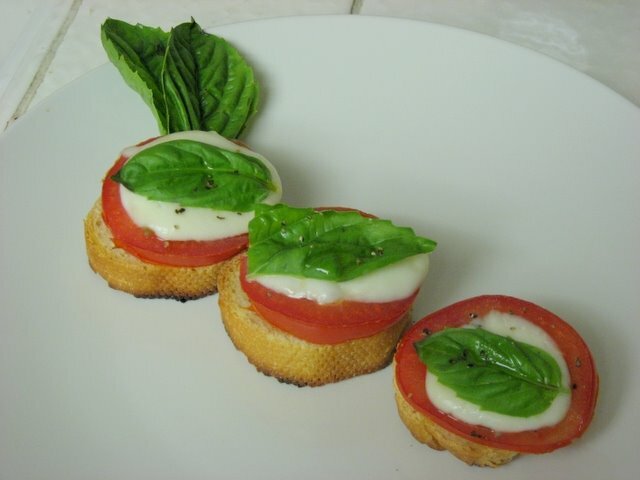 Both of these recipes turned out really well and were so simple to make. The total cooking time was about 30 mins for both dishes. The salmon was very easy in terms of cooking and clean-up…basically, you just take your salmon fillet, place it on a sheet of foil, season with salt, pepper, lemon, rosemary, olive oil, marsala wine, and wrap it up into a foil packet and bake! I know the recipe calls for cooking it on a grill pan, but I decided to put it in the oven at 425 degrees for 15min and it came out perfect. While the salmon was baking, I was making the orzo pasta…if you don’t know what orzo pasta is, its basically rice shaped pasta. So, to make the Tri-Colore Orzo, I took the cooked orzo pasta and combined it with the olive oil, dried cherries, arugula, basil, pine nuts, lemon juice, salt/pepper, and feta cheese (I couldn’t find the ricotta insalata cheese the recipe called for at the grocery store) into a large bowl. The orzo pasta paired really nicely with the salmon and the combination of these two recipes made for a delicious light and healthy dinner. One thing I should mention is that you can eat the orzo pasta hot or cold…its great both ways, and the combination of the cherries, pine nuts, basil, arugula, and cheese makes this dish very addicting. I love it. This picture was taken just before I was about to place the bowl on the dinner table and it slipped out of my hands and there was orzo pasta everywhere…yea I’m very clumsy and I make myself laugh hahaha. An incident like this just reminds myself why I can’t have my own cooking show…it would be a DIASTER. Luckily, I made a lot of orzo pasta, so there was enough left for dinner haha. Salmon with Lemon, Capers, and Rosemary – So so good! Make sure you use marsala wine, I think it really makes this dish tasty. Giada – I just had to post this up…I found it and this totally cracks me up…yes, it is a bit scary because its reminesent of Carrie, but I still love it anyway haha. Tonight, I made this quick and very easy parmesan chicken (recipe courtesy of Barefoot Contessa from the Food Network). I found the recipe last night and it got a 5-star review from almost everyone that made this dish, so I thought I’d give it a shot. The prep-work was so easy and the chicken was cooked in no time! One thing about this parmesan chicken is that its not your traditional Italian parmesan chicken with marinara sauce. 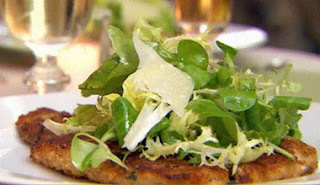 This chicken is breaded with bread crumbs and parmesan cheese, pan fried, then topped with fresh salad greens with a lemon vinaigrette. I was really surprised that the greens with the vinaigrette paired really well with the chicken. If you do try this recipe it’s important to note that you should eat the chicken with the greens on top (rather than just a side salad) because it really makes this dish. Preheat oven to 400 degrees F (200 degrees C). Line a cookie sheet with foil. Sautee onions and garlic in pan until tender. Set aside. In a large bowl, whisk together mayonnaise and milk until smooth. Whisk in eggs. Layer broccoli, cheese, bacon, and onion & garlic in pie shell, making several layers of each. Pour in egg mixture. Place quiche on prepared cookie sheet. Cover quiche with foil. Bake in preheated oven for 40 minutes. Remove cover, and bake 10 minutes, or until top is golden brown and filling is set. For my birthday last week, my friends surprised me with a Panini Press. 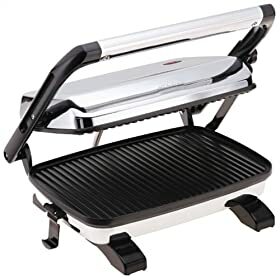 I’ve always wanted one, and now I can finally panini press my heart out. I was so excited when I unwrapped my present, I think I was a little too excited. Anyway, I haven’t gotten the chance to experiment with it, but I will sometime this week. So, expect a post on my panini adventures very soon! So, my boyfriend and I decided to find a recipe on the Food Network website and become iron chefs for a day. We settled on a chicken carbonara recipe from Giada De Laurentiis. Giada hosts the show Everday Italian, where she prepares and cooks some of the most appetizing and delicious Italian or Roman dishes. This show is definitely my favorite, especially because she actually makes food that looks and tastes great, and she’s not corny or prone to making strange faces like someone else on the food network (hint: this particular chef likes to say “Yum-O” repeatedly on their show, making me want to shoot myself). 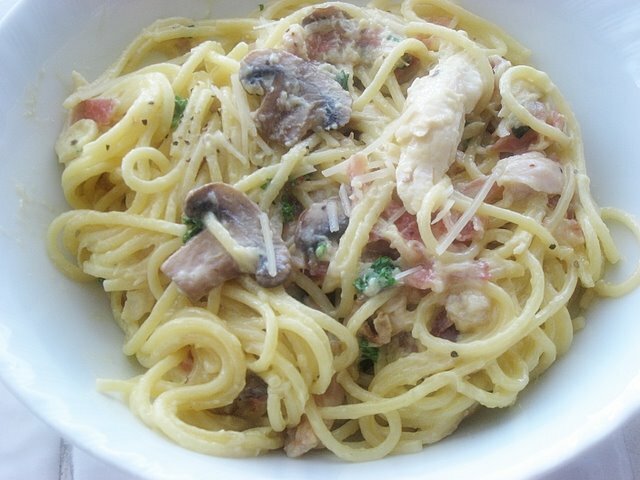 Moving on, our chicken carbonara turned out great! We halved the recipe and added some sliced mushrooms to make it even better, and in the end we gave it a 5-star rating! I never knew you could get very stylish with aprons, but these aprons from wishingfish.com are beyond cute! If only they weren’t sold out I would’ve ordered one already.